Unless holders are in stock 8 to 20 weeks delivery from time of deposit. 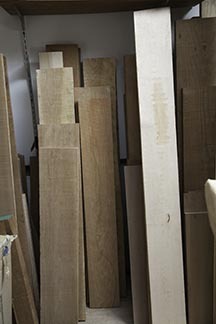 The wood used in the construction of film holders and custom large- and ultra-large-format cameras is hand-selected prime quarter sawn Pennsylvania-grown Cherry. The sawmill is a small family operation in Pennsylvania that hand selects the logs that they use to produce the lumber they make available to master craftsmen. The wood is far superior in quality when compared to the lumber available from wholesale wood suppliers. They also use a slower, better drying process for the wood. Wholesale suppliers use a kiln to dry lumber. This method is quicker because the wood is dried in a heated kiln. But depending on the temperature of the drying, kiln the wood can take up to a year to get rid of the stress the wood picks up in the drying process. For most applications this is not a problem. 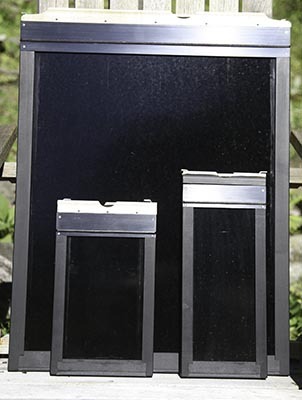 It becomes apparent when doing very critical woodworking, where the parts must stay flat in all types of weather conditions and hold tight tolerances. 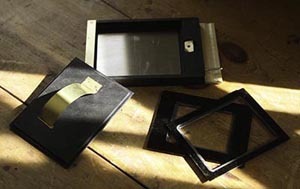 Film holder stock is age 6 months or more before using.